Intel has decided to release some Haswell information early on a Saturday morning for no logical reason mirroring the SKUing strategy. 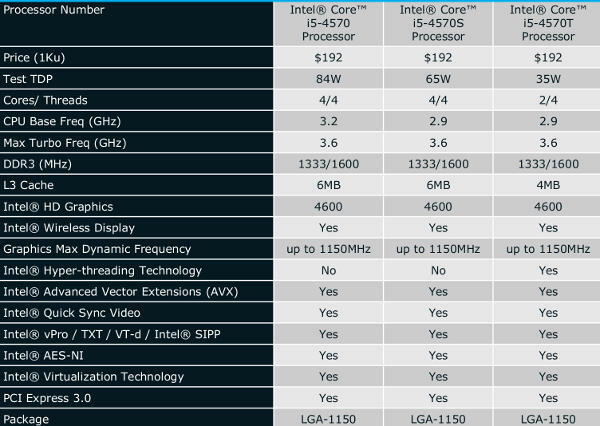 If you want to know what CPUs are being released and their specs, read on. Haswell has two types of CPU, mobile and desktop with the main difference between the two being an integrated CPU + chipset package or a traditional two chip design. 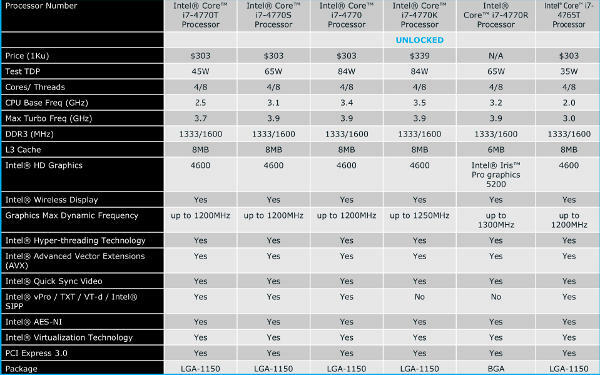 Intel being Intel, the logical way of assigning them to product was thrown out the window but all CPU + chipset packages are BGA only, all desktop parts are dual chip but some are BGA and others PGA for no real reason. Mobile SKUs with GT3e graphics, that would be the Crystalwell memory we exclusively told you about over a year ago, are two package BGA devices and mobile only. Things are clear as mud on the packaging side but it does get worse, far far worse. Haswell mobile parts come in four flavors, H-, M-, [embargoed], and [embargoed]-Series essentially to make sure no one understands what a product actually is. H-Series are quad-core parts with the least anemic graphics, that would be 40 shaders and Crystalwell aka GT3e, conveniently named Iris Pro Graphics 5200 for no apparent reason whatsoever. At least most of them are, there are a few SKUs with GT2 graphics but none with GT3 sans e though. GT3 and GT3e are mobile only once again for no logical reason either. M-Series parts are the same thing as H-Series but with GT2 graphics only on all SKUs. Desktop parts come in normal, K-Series, S-Series, and T-Series, but there is also an R-Series to confuse anyone trying to figure this all out. Normal means 84W TDP, T-Series means 35W or 45W, and S-Series is 65W. R-Series has nothing to do with wattage, it just means BGA packaging and GT3e graphics on a ‘desktop’ part that can only be soldered down. Logical it isn’t, but this is Intel SKUing we are talking about, what did you expect? For the i7 line they all cost $303 except the K- and R- parts which are $339 and N/A. R- doesn’t have a price because they are soldered down, and since they are based on the GT3e parts they won’t be cheap. That said, you can’t actually buy one without the rest of the device wrapped around it. Other than that, no difference in price based on speed or wattage. 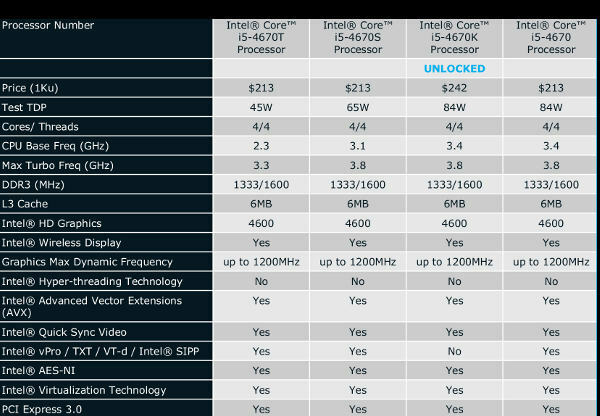 It would be an interesting choice but Intel basically raised the top price about 10% over Ivy Bridge and then jacked all i7s up to that new point. Can you say not worried about competition? Worst of all the K-Series parts are utterly crippled. Yes Intel gifted us with unlocked parts for about 10% more, or should we say that they didn’t remove the overclocking features for a steep price. Unfortunately what they removed is much more than clock locks and definitely more useful to the buyer. If you read the chart, vPro, TXT, VTd, and SIPP are removed, as is transactional memory but they don’t tell you that. If you get a K-Series device you can’t use virtualization, none of the management features are there, and neither is the hardware security that they said you absolutely needed last generation. This generation you don’t seem to need it any more though but you are definitely better off without Intel “security” features. Removing transactional memory, TXT, and VTd are just dumb, plus the K-Series SKUs are so crippled you should avoid them abusive price premium or no. i5s are much the same as the i7s but come in at two price points, $213 or $192 with the lone K-Series part at $242. There is no BGA version and all of them lack HT. Since they all are GT2 SKUs they all have 20 shaders too. There does not appear to be a GT1 SKU listed anywhere but they will most assuredly come in due time. The M-Series SKUs that we can talk about, not that there are any more, honest, are all GT2 SKUs with HT not turned off. Unfortunately Intel crippled the lower two SKUs, i7-4702MQ and i7-4700MQ in the same way they crippled the K-Series by turning off the features that were absolutely necessary last generation. Worse yet they added the Small Business Advantage security hole to the mix, but for some reason won’t list the price. If you think SBA is just an unacceptable security risk you are dead wrong, SBA is an expensive unacceptable security risk. Avoid those SKUs like the plague. The H-Series chips are much the same as the the M-Series but there is no 57W top variant and DDR3 is not supported either, only DDR3L, plus there are some variants with GT3e graphics. If that doesn’t deserve a whole new naming scheme, I don’t know what would. The last three SKUs are crippled similarly to the M-Series and SBA precludes security on any device with these parts.